The caneo L (long seat depth) is particularly designed for people taller than 1.8metres. The Caneo is an impressive design, setting new standards for entry level folding wheelchairs. Reliable and easy to manage wheelchair is ideal for home or hospital settings. The frame design guarantees greater stability than ever before. The comprehensive standard functions meet the highest levels of user-friendliness and practically for daily use. 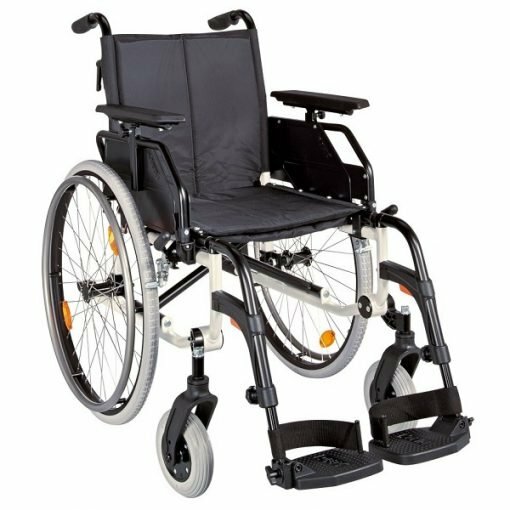 Seat width 51cm, Seat depth 47-51cm, Seat height 48-57cm, Backrest height 46cm, Adjustable Armrest heights 24/26/28cm, Gross weight 19 kg and Net weight 14 kg.